12/17 Monday, 61/43, sunny, NW5-10 - The sunrise was so pretty this morning, I stepped up on deck to photograph it. We had several errands to run in our two-hour courtesy car window - fill the propane tank we use for cooking, buy stamps, purchase replacement metric bolts for the engine bell housing, and go to West Marine for 100’ of 1/4” chain, seizing wire, and LifeCalk. We also stopped at Walmart and bought spray paint to mark the chain at 25’ increments. Mulling it over the last couple weeks, we’ve come to the conclusion that it’s worth it to carry more than 30’ of chain plus rope, and that Grace can without being bow-heavy. From the just north of South Carolina to mid-Florida, most anchorages are in narrow creeks that average 17’ deep at low tide, with an 8-10’ tidal range. That’s roughly 30’ of anchor rode just to set the anchor on the bottom at high tide. With rope, at a scope of 7:1, we need 210’ out - too much swing arc for the room available. With mostly chain, we can set 5:1 (150’) or even 4:1 (120’) and it’s a lot more likely we’ll fit without crowding the banks. We’re also hoping that Grace will sail a bit less at anchor with more weight on the bottom, but that’s a secondary benefit we’ll be pleased with if it happens. Our new arrangement is 100’ of 1/4” chain and 120’ of 1/2” rope. We plan on a longer rope section in the future, too, when our finances allow. We’ll start with a basic snubber setup - probably a 25-30’ length of 1/2” 3-strand with a thimbled eye and a Dyneema soft shackle, taken through a bow chock to a cleat. The chain will go over the anchor roller and to a second cleat. We’ll see how that works for us. I suspect I’ll need to be a better chain scrubber (I have no patience - too eager to get underway) when bringing the rode aboard so as not to make a muddy mess of the deck and anchor locker. In the afternoon, while I wrote up notes to share with a rigging inspection client, Dobbs used the spray paint to mark the new chain and pulled our existing rode out onto the dock. He’s waiting to do the splice for our rigging tools to arrive in the mail. USPS had them slated for delivery on Saturday, but checking tracking today shows the package in Charleston. At marinas where cruisers congregate, the “mangrove (or in this case marshland) workshop” is ubiquitous. I took Murphy for a long afternoon walk and Dobbs strolled the docks handing out flyers. As evening came on, we settled in on Grace, sipping wine, and I wrote for our blog. For dinner, I opened a jar of Tilghman Island stew I’d canned over the summer (sans crab). I added some chicken neck and back meat to it because, let’s be honest, Maryland crab soup is so redolent of Old Bay that the crab taste (or chicken) is minimal. Bits of chicken look just like bits of picked crab and have a similar texture too. 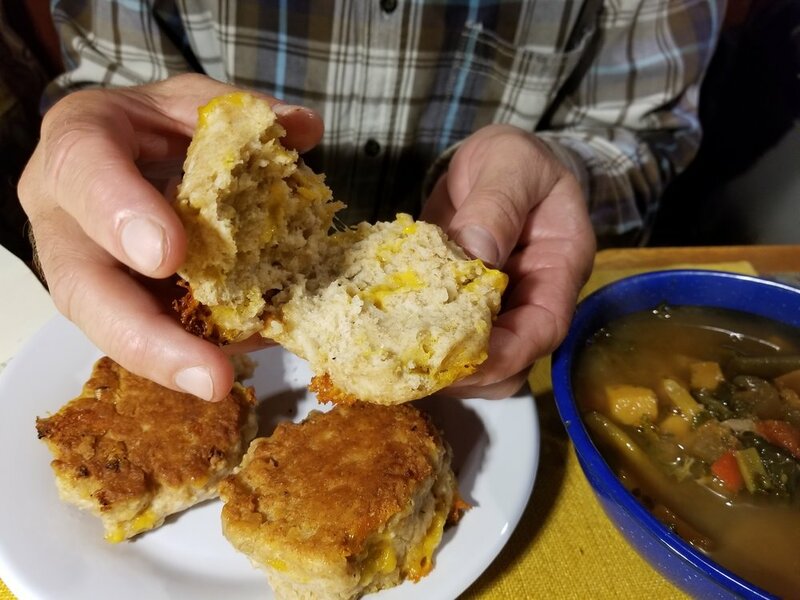 I can hear whisperings of, “Blasphemy!” from the Chesapeake Bay… I paired the soup with cheddar biscuits made on the stove top - they turned out perfectly!